Arjan de Kock spent most of his winter bouldering and managed an impressive ticklist with the second South African ascent of "Tea with Elmarie" 8A+ as well as sends of "Pendragon", "No Late Tenders" both 8A and the rarely repeated sit start to "Question of Balance" called "A Matter of Power" 7C+. 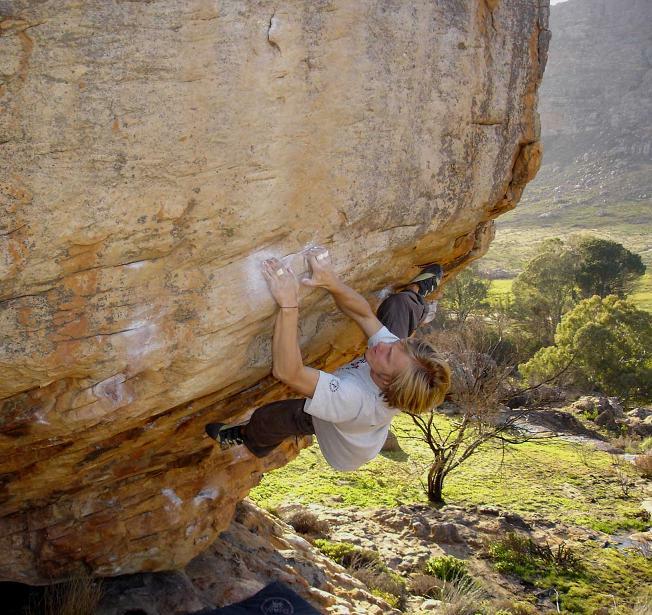 Justin Hawkins sent his first 8B "Armed Response" (with "Leopard Cave" now at 8A+) and flashed "Black Spider" 7C. Ben Harper made a fast repeat of "No Late Tenders" 8A and Shaun Jansa sent the impressive dyno "Black Velvet" 8A. Marijus Šmigelskis also managed to repeat "Tea with Elmarie" 8A+ for his first of the grade. Marijus on "Tea with Elmarie"